In early June, I packed up the remaining forty-odd cups from FLOW in a large box, loaded them in my trunk, and headed for Interlochen, Michigan. I’d been invited to spend this summer teaching ceramics at Interlochen Center for the Arts Summer Arts Camp, and it felt right to share this project at the faculty art show. The camp runs in two three-week sessions, and my first session ceramics majors jumped right into the project with only a brief introduction and one quick session of practice. On Thursday, July 3, seven students did over forty interviews at the opening, in less than an hour and a half. Interviewees were campers in grades six through twelve and adult faculty, staff, and guests. At the end of the evening, only two cups remained on the pedestal. Those disappeared the next day. 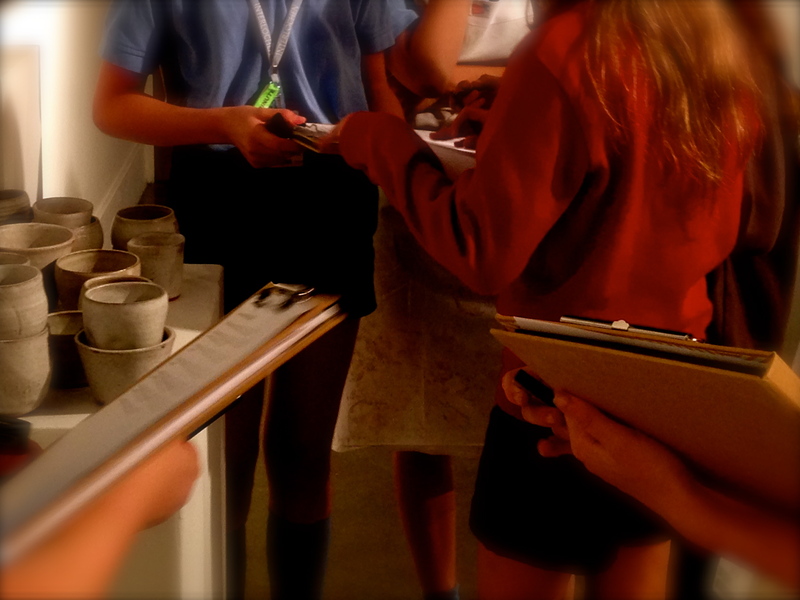 To our amazement, two additional participants wrote their answers to the questions in a clipboard we had left behind in the gallery. I’ve seen the QR-coded cups around Interlochen’s campus – cupped in hands, in the cafeteria, in the Writing House, warming tea. 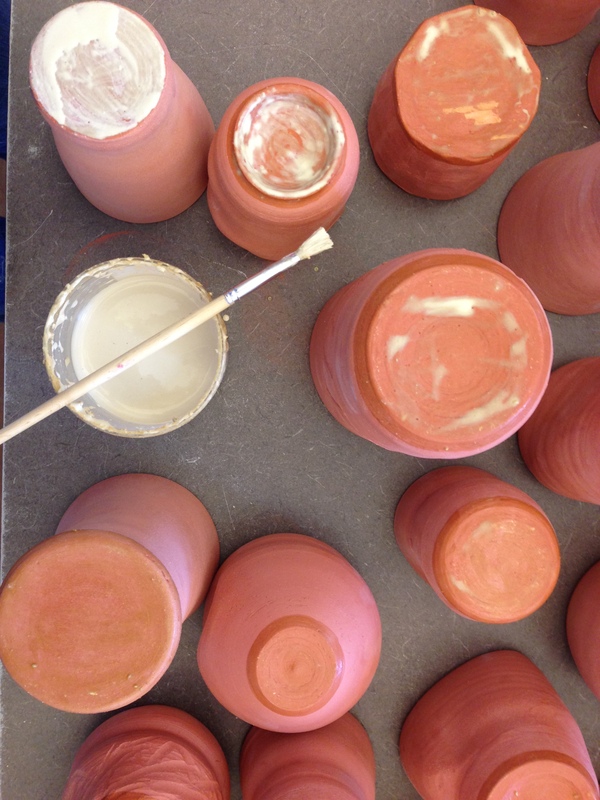 By the end of three weeks of great work in the studio, my ceramics majors understood the meaning of ‘flow.’ Kate B. wrote this thoughtful and honest post to share her perspective on the interview experience. In complete honesty, interviewing strangers about a concept known as “FLOW” – which we were told little about prior – was not how I wanted to spend my evening. We were asked – no, closer to requested – to present ourselves, donning clay-splattered aprons, with recording devices and notebooks, pens and agreement forms. Kate commanded we merely interview the strangers about what caused them to lose track of time, have them sign the agreement form (so that the interviews could be posted on cups), and bestow upon them one of the many leftover cups from Kate’s previous installment of the piece. Soon we were garbed and punctually prepared, standing stoically by the pedestal that held, oh, say 50 of these speckled porcelain vessels. By this time, we had grown in enthusiasm, and everyone wanted to do the first interview. The answer was yes. I took my patron to the hallway, still empty and quiet what with the earliness of the opening, and commenced the oral questionnaire after receiving, in turn, a signature of agreement. I was ready, so very ready, to hear this young lady pour every inch of her feelings into this little battery-powered box. What I got was possibly the blandest nonsense I’d ever heard. And then there was the next one, and the next one – by this time my coworkers had also begun interviews – and even more after that. No matter how I worded the questions, no matter how I smiled and tried to seem fascinated as I was pelted with bullet-like one-word answers, no one cared to elaborate, to lose themselves in describing their passion as Kate had promised. How disappointing, I thought, snapping out of a daze as a confused young Intermediate asked, “Can I have my cup yet?” These people were not interested in FLOW, they were not interested in opening up to a complete stranger as much as myself. And for what? A rock-hard hunk of clay that someone else had put their time into, had lost themselves in? I thought about the interviews as I walked back to my division. There were some gems, of course, but for the most part all I got in accordance to passion was sand – dry and numerous. These people only wanted cups; they didn’t want to lose themselves in some pointless interview. They had places to be, but by God, they wanted their cups, and they’d go through the motions just to get one of those smooth, white clay vessels. It was then that I realized I was in the wrong. There I was, expecting people to ramble about their passion and being thoroughly disappointed, while I only had to look at their motives for tolerating me and my cohorts. These people didn’t care to elaborate on their FLOW – they wanted to experience that of others in a physical form. In the cups, Kate and her students had created a physical embodiment of losing track of time – they’d spent hours, days, weeks, at wheels, spinning and spinning and throwing and throwing. Over and over again. The interviewees did not want to talk, they wanted to look. Even subconsciously, they were more interested in the passion of others over their own. Isn’t that why people go to art shows, anyways? To see the interests of others take on literal shapes in our plain plane? Anyone can go out and buy a cup, I remember thinking, but to have to sit through an interview just to get one – by golly, that’s dedication. 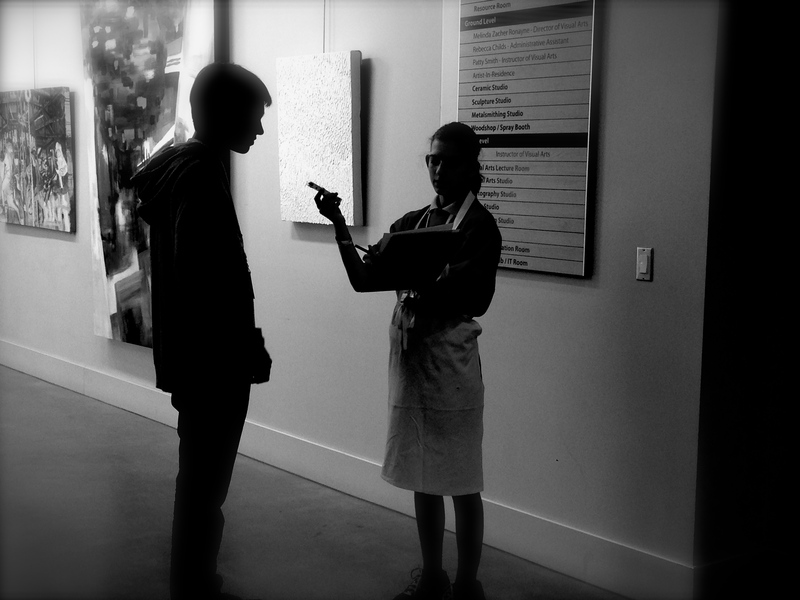 It was inspiring in that people cared more to own a labor of love than to prattle on to a teenage girl about their own. Well, good for them! At least someone here is honest with themselves, I thought, embarrassingly recalling how ceaselessly I had spoken about art for my own interview. Enjoy those cups, you uninteresting folk. Enjoy them, because if you simply don’t have a FLOW, you might as well lose yourself in someone else’s. Would I install FLOW again at a traditional art opening? I’m not so sure. Kate raises some interesting questions to consider here. But it seems I’m going to have to figure this out – because we have a new batch of interviews to share, and so I’ve been making some new cups whenever I have a few minutes to spare in the studio. Grateful to my ceramics students, all interviewees (willing to talk and eager for cups), Kate B. and her parents, and especially the Interlochen Visual Arts department for the support. And always to the original collaborators. It has now been over a whirlwind week since we returned from Boston. Reality hit all of us pretty hard when we got back. I’m not sure that any of the students would describe the common app, finalizing the first quarter, or catching up on tests as ‘flow’ experiences. Nor would I categorize my gradebooks that needed to be tidied or catch-up work as immersive or enjoyable. We have quickly moved into our next project, with loose ends from this one still to finish. Such is the way a school year goes. But I can’t let this weekend go by without noting a few important thanks. Christian Talbot for reviewing the proposal in advance of submission, giving the thumbs-up, rallying the financial support, tweeting and sharing our experience, and – in advance – helping us with the wrap-up. We are deeply grateful, and we hope that we can share this project in a way that has community impact for our school. Dave Griffith for insisting that I finish the proposal, sharing yours with me, and seriously being my favorite collaborator in the universe. I cannot wait for the next book. Also, to Brandon Som for the concept in the first place, awhile back, with summer crickets in the background. Aliza Greenberg & the organizers of the Harvard AiE CtC Conference for accepting our proposal, answering all of our questions in advance, providing wisdom and advice, and your warm reception. We hope that you were able to enjoy the entire event as much as we did! Jackie White for humoring yet another of my crazy ideas, stocking us with clay and glaze, navigating a crazy van ride, and helping to keep a watchful eye over the whole experience. Jamie Wasson for making the time to join us at the conference and helping us to document, while our hands were muddy and our minds busy. John McGlinn for wisdom, finding the best Italian restaurant within walking distance of our hotel, guiding the boys around the city (and getting everywhere we needed to be on-time), thoughtful advice, and all of your warm support. You can co-chaperone an arts department trip anytime! Everyone we interviewed… thank you for making the time to have a meaningful conversation with us. I think all of us can echo Drew’s comment: “I feel like I’ve become wiser with every interview I do.” We learned so much from you, and we are grateful for the ongoing conversations sparked by our dialogues with you. Parents… thank you for trusting in an unusual idea, for your overwhelming support of your sons along this journey, and especially for helping them to find balance along the way. Also, thank you for overloading our van with snacks – even a couple of healthy ones! And most importantly – Thank you to the student collaborators on this project. Your trust, willingness to step outside of your (our) comfort zones, advice, flexibility, and open minds made this whole experience a joy. I hope Flow was a thought-provoking boost for you, throughout the process and through sharing the product. I’d collaborate with any or all of you, anytime. There’s still more to come, but as we consider the wrap-up and sharing of this project, we will do so in a spirit of gratitude. No matter what happens, everything seems to work out how it’s supposed to. It might not be perfect; there will be quirks to be remedied, but in the end it will all come together. We had to have this mentality before the conference because that was the reality: we didn’t know exactly how the conference was going to work. I think I can speak for myself, as well as the group, when I say the whole trip (conference, RadioLab Live, touring…and especially the food) worked out great. Standing by the cups we had made ourselves, waiting for a curious conference attendee to walk by, I thought about the work we put in to get to that point. All those hours were paying off, but it’s not the “thanks for being here” or the “great job” comments that makes me satisfied with what we did. What I’m excited about is the fact that we are making people think about something powerful, something that many had never pondered before. More than one person I’ve interviewed said that they hadn’t thought about the idea of flow, especially the why, the how, and the when. All of them said they are glad that this made them do so. We were able to make that connection because we were all sharing ceramics, OUR version of flow. One thing that has been consistent across all my interviews, especially all the artists and theater-folk at the conference: people love describing their flow. They get lost in the moment. They become so animated that they might even forget where they are or what they’re doing because they are describing their passion. After interviewing my grandparents last week, I asked how long they thought their interviews were (because they thought 3 minutes would be hard to reach). Both interviews were well over 5 minutes, and BOTH of them underestimated the time of their interviews. Just as we all lose track of time in our flow, we get lost in the moment of describing our moments because that’s simply the power of FLOW (woah…). People never expected to receive a free cup, but just as often people never expected to talk about a moment so special to them, and standing beside the table seeing all seven of us doing interviews, I could almost feel the FLOW around the room. 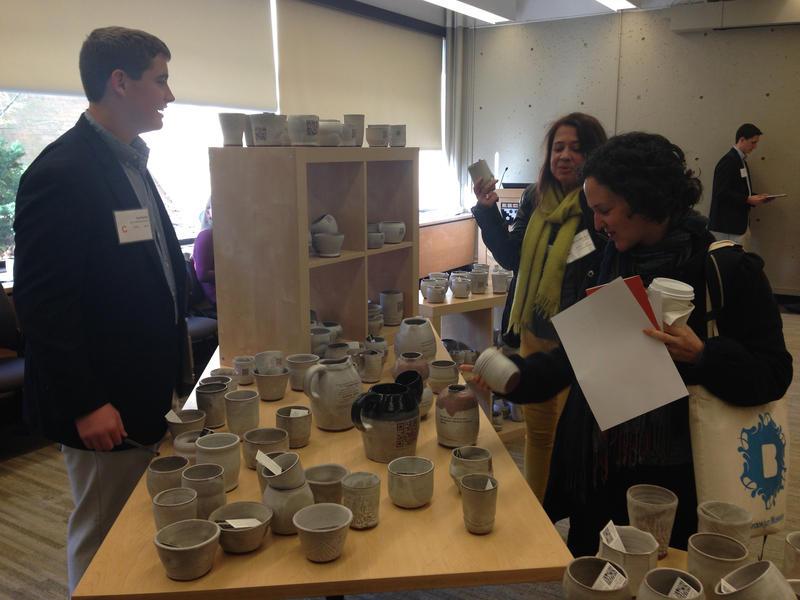 “Oh my, what beautiful cups you have here!” Countless times my peers and I were told some variation of this over the weekend at Harvard. These people walked in to the convention seeing tables filled with 200+ handmade cups with these strange codes on them. It seems like nothing to any of us here, for we spend so much of our free time immersed in the ceramics studio (maybe because we find our “flow” there…), then we told them to take one… and they stopped. Confused. Wondering. Questioning. A free cup? This brought me back to my lesson one day in AP Economics. In an economical way, nothing in our world is free. Unlimited wants with limited resources. Everything has a cost. I thought about our project, and these cups really aren’t free. We wanted to hear about the flow in other peoples’ lives. Where they experience this – what they experience there – and what it means to them. 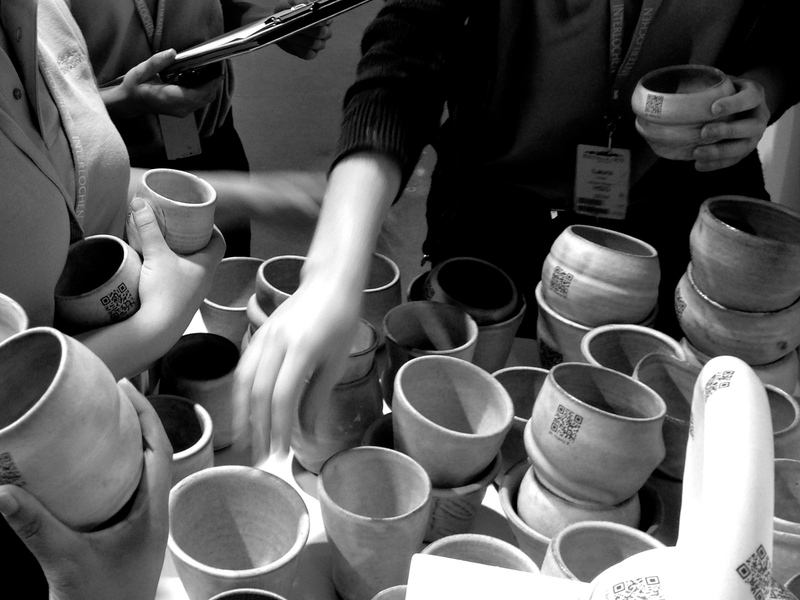 It was truly rewarding to share in this cycle of flow, for we found flow interviewing, making the cups, and using technology to add QR codes, and the people we interviewed talked about their own experiences with flow. Yet that economic mindset remained with me. Which opportunity cost was greater? Which person gave up more? We gave up a handmade cup. 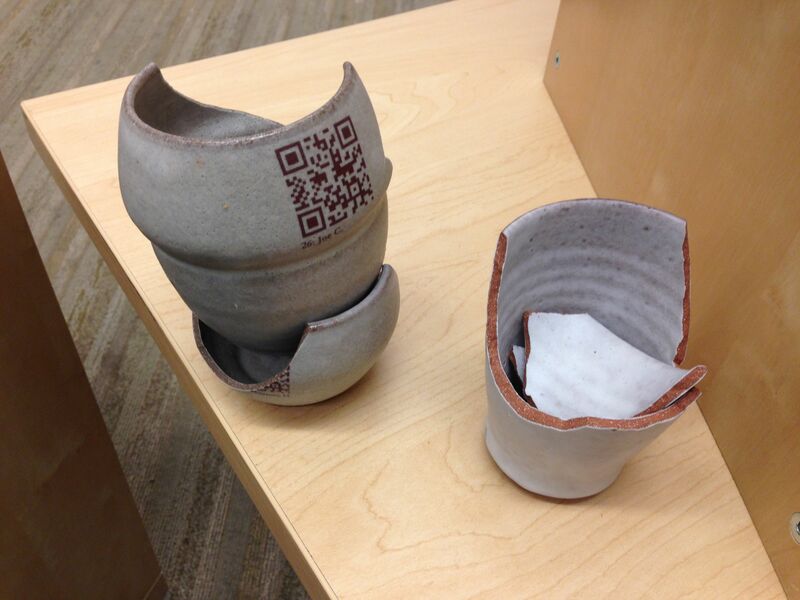 Cups that we spent time throwing, trimming, glazing, personalizing, and adding QR codes to were just given away. 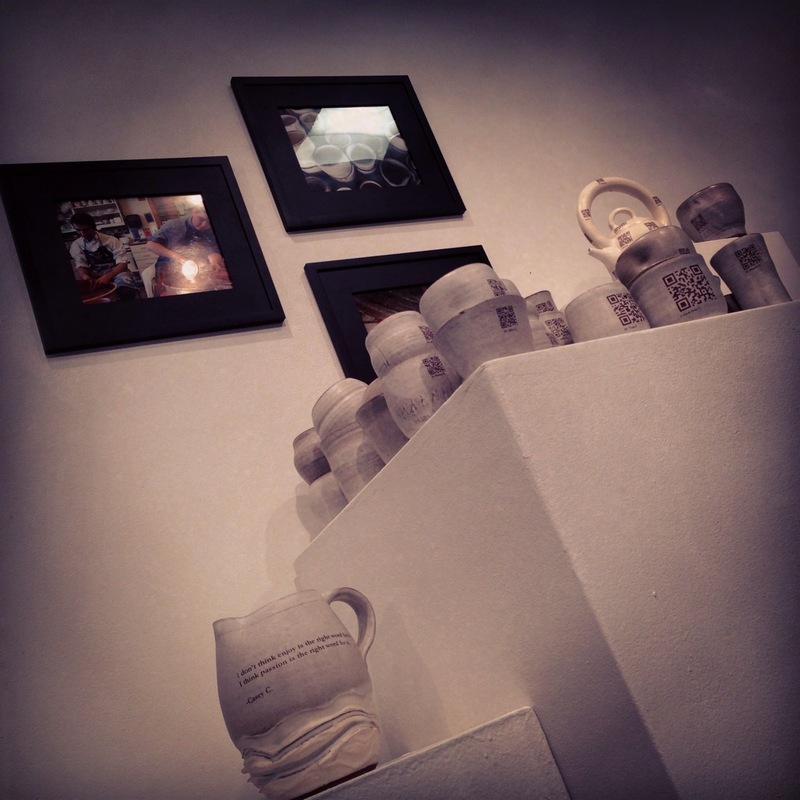 Sure ceramics comes easy to us, and a cup seems like nothing at this point, but some of them we added ourselves to. We found our flow when making them. We became attached to a few of them. We hid a few of them on shelves in the back in order to save them for ourselves, but they were found and taken. They gave us interviews. They talked with complete strangers about something that’s vital to their well-being. They talked to us about emotional and physical conditions that they experience in their flow. Some of the stories were personal. Some of the people were a little hesitant about talking with complete strangers about this, but then again, they got a beautiful ceramic cup out of it. So when it comes down to it, we had to give away something of our own that we made and loved, and they had to share experiences and emotions with complete strangers. Though the question still remained, who had the greater opportunity cost? I can’t speak for everyone, (although I’m sure I am) but for me a cup seems like nothing compared to hearing other experiences with flow. We gave away some great pieces, some that we may never be able to replicate the same way again, but giving up some cups in exchange for personal interviews, experiencing flow in the process? Well, that’s not free, it’s priceless. I nervously asked this question in a breakout session this morning. My heart had sunk a few minutes earlier, when the session’s participants introduced themselves and their credentials. An overwhelming array of education, expertise, and mover-and-shaker-ness was in this room. Harvard grad students, teaching artists, mid-career professionals, people responsible for causes I follow and believe in. I felt humbled. When it was my turn, I mumbled something about teaching at a private school, and turned to the next person to deflect the focus. While interviewing people at the conference yesterday and today, I really enjoyed hearing what they had to say. With most of the people at the conference being educators, there was a recurring theme in a lot of my interviews. For about half of the people, they said that their passion, their sense of flow, comes from their work. Hearing this was great – that people that teach find that they truly feel concentrated, and completely immersed while they are passing along knowledge to others. In my opinion – I talked about in my interview – having a teacher be in flow is half of the winning recipe when it comes to education. The other half is the students. Without them being fully into a lesson, then the efficiency of the teacher is lessened, and vice versa. Taking a brief look at this microcosm, the teachers are fully involved and ready to give their all. As a student the choice comes down to us whether or not to meet the teachers halfway. A common question that we received today at the conference is “how much?” I love this question. I love it because I know that my answer to that question will completely catch them off guard and make them feel good. It’s exciting for me and the person asking. I am excited to see the reaction and they’re excited to hear that this cup is free of charge. At Malvern we have been taught how to give our pieces away. 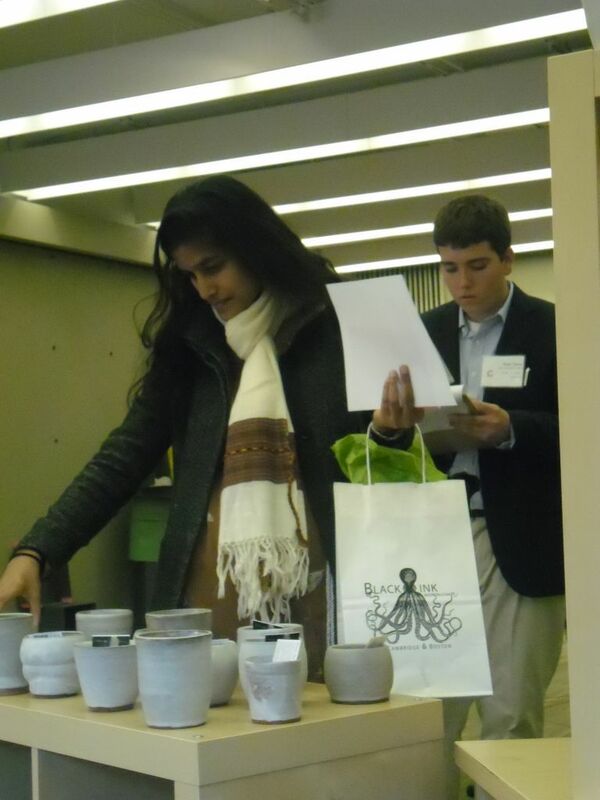 Last year I participated in the mug assault which is where students make 25 well crafted mugs and give them away for free. You’d be surprised just how challenging this task is. Most people think that there is a catch behind the whole thing and others won’t even make eye contact. Either way we found a way to give almost all of them away. We also have Empty Bowls where students, faculty, and family members throw bowls for an event to raise money for the homeless. Every bowl we make is given away and we usually will not see it again. But we do it for a greater cause and also because it just makes us feel good. Aside from seeing someones reaction to us telling them it is a free cup – it goes a little deeper. You know that the person will hold on to that cup and whenever they look at that cup, they will think of us. It’s such an out of the ordinary thing that it sticks to us. For the potter, it feels good to know that something you made and put time into will be cherished and used as a spark for a memory. Giving work away creates such a strong connection that goes unnoticed. It’s a powerful thing and I think it is safe to say it is one of our most favorite things to do in ceramics. This site documents our work at Malvern Preparatory School in Fall 2013 towards an installation at the Harvard CtC Conference, October 25-27. In this installation, we propose to explore space, time, and structure using ceramics and storytelling. Through a social experiment grounded in generosity and empathetic conversation, we will create a dialogue that explores similarities and differences between how youth and adults experience these concepts. Read more.